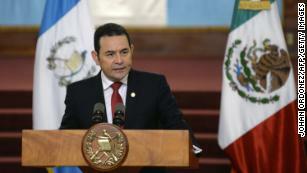 (CNN) Guatemala plans to move its embassy in Israel to Jerusalem, Guatemalan President Jimmy Morales said on his official Facebook account on Sunday. President Jimmy Morales, in Guatemala City last June. Guatemala, the United States, Israel and six smaller nations voted against a United Nations resolution to condemn US President Donald Trump’s decision to recognize Jerusalem as the capital of Israel. The vote on Thursday was overwhelming, with 128 in support and 35 abstentions. Another 21 countries did not participate in the vote. The Central American nation is the first country to announce it would move its embassy from Tel Aviv to Jerusalem since Trump issued his announcement December 6. “Today I spoke with Israeli Prime Minister Benjamin Netanyahu,” Morales said on Facebook. “We spoke about the great relationships we have had as nations since Guatemala supported the creation of the State of Israel. One of the most relevant topics was the return of the Embassy of Guatemala to Jerusalem. “I inform you that I have given instructions to the Chancellor (Foreign Minister) to initiate the process to make it possible. God bless you,” he said. On Monday, Netanyahu praised President Morales and suggested other countries would soon follow. Last week, Netanyahu told CNN that “several countries” were considering moving their embassies to Jerusalem in the wake of Trump’s decision. “Your decision proves that you & your country are true friends of Israel & I am confident the ties between us will only grow stronger to the benefit of both countries,” he said in a tweet.